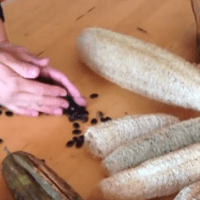 I recently learned that the loofah, a cylindrical type of sponge, is actually a gourd that you can grow relatively easily at home! Just image, a whole sponge farm of your very own! Never again would you have to buy a sponge! Check out how to extract the loofah here!